Without Hitting a Wall of Resistance or Retreat? You've always believed you have good listening skills. You're clear there are topics you should discuss with your aging parents, or things that others in the family need to know. But every time you think about starting to talk to them, you get that queasy feeling in the stomach, somewhat like preparing for the big drop of a roller coaster. You're getting somewhat anxious. You already know that you're not in control. But you're, also, sure that those unexpected twists and turns of aging could lead to really unfortunate consequences for your parents and the whole family. It is true, that talking about the stuff of aging will never be pleasant. But it IS POSSIBLE to have a method, and learn good listening skills, to dial down everyone's anxiety and increase a sense of confidence, candor, and trust. What if there was help? 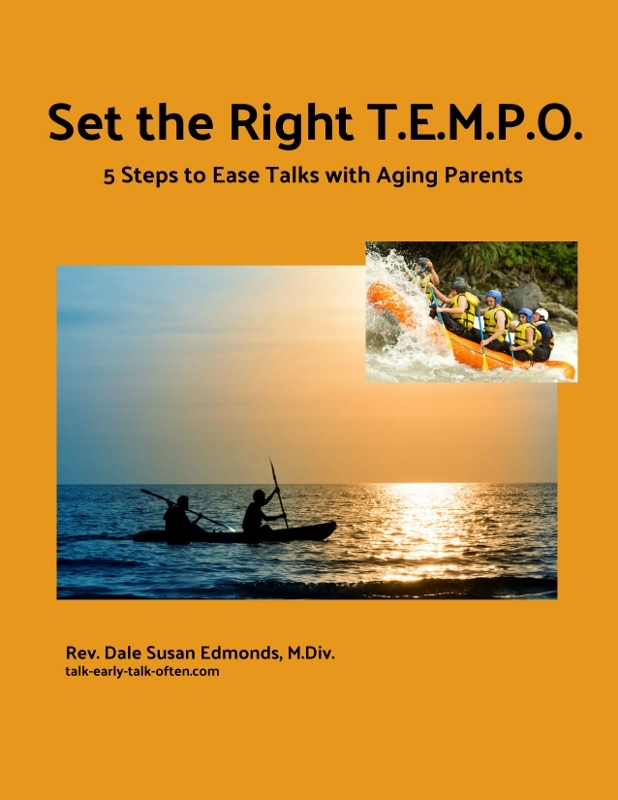 Set the Right TEMPO: 5 Steps to Ease Talks with Aging Parents does just that. In my work with families over the past 30 years, in both congregations and hospices, I often got the frantic calls after families had had a crisis with aging parents, but failed to have the prior conversations that could guide them to decide on the best next steps. This guide was born with the hope that it will help families learn good listening skills and move forward to navigate the uncomfortable conversations today, so they may have more assurance and peace of mind in the future.